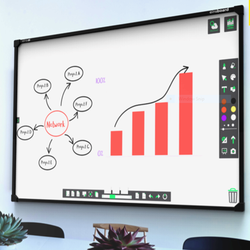 Prominent & Leading Wholesale Trader from New Delhi, we offer ir interactive ceramic whiteboard and eins board optical interactive smart board. We have achieved an incredible position in the industry for presenting excellent quality IR Interactive Whiteboard. Interactive Whiteboard integrated with patented IR sensor module can offer high stability and reliable true 4-point touch confidently. The valuable integration in mechanical hardware design and software leads the performance in writing or touch the superior experience you ever occurred.